If you follow or frequent any resource by a popular pro blogger, you are most likely to have heard the term “guest posting” plenty of times. The thing is, everyone is talking about that, publishing guides and eBooks but seldom would you come across an actual tool that would help you get started. I’ve been guest blogging for as long as I have had my own personal blog. Actually, all my online visibility I managed to build through the years has been achieved due to guest blogging. A guest post brought me the position of a permanent blogger and then Editor-in-Chief at Search Engine Journal (and now Director of Media at BlueGlass). Another guest post helped my blog to get discovered by smartest SEO audience. I’ve been promoting all my projects with guest posts and have long been an avid believer in the beauty of the win-win concept of guest posting. Really, the idea behind guest blogging is genius: the author gets exposure through providing great content and the blog gets a killer post that attracts new readers and followers. In fact, the idea is so great that it is almost impossible to organize and monetize without screwing the concept… And that was the first problem I was going to face. I’ve always known guest authors and bloggers need a place to get connected and exchange guest posts. But how should it be implemented? Turning it into a well-organized marketplace was my initial idea. But I never ended up creating the marketplace. I suspected the “marketing” thing could spoil the initial idea. I knew most (successful) bloggers were busy and they would hardly manage to frequent yet another community (luckily we have plenty of networks)… And that was the second problem I was going to face. I decided to stress upon the power of the concept and the innovative features that would help to organize the process without spoiling it. I had no idea which of the features would turn really popular in the community where the main aim would be to exchange guest articles. So I decided to start with something basic and build new features following the community demands. MyBlogGuest.com was launched about 11 months ago and has been getting new features ever since. The first year has been exciting. I consider it alpha period when we were developing the site while inviting new users. The discussion board: Here people can talk to each other, discuss post ideas, build contacts and advertise guest blogging opportunities. Advanced search: Users can search each other by tags, forum mentions and blog categories. Articles Gallery: If a user has an article he doesn’t know where to publish, he can upload it to the Gallery and wait for the blog owners to come (instead of looking for bloggers himself). Watch list: Users can organize new relationships they build using the feature and also set reminders to never forget apply to the offer or send a guest post. How Can MyBlogGuest Turn Useful? Positioning yourself as expert (which will help you build trust and become niche authority with time). Wow, I didn’t Mention Backlinks, Did I? Don’t get me wrong, I am fully aware of the backlinking benefit of guest blogging. However I don’t recommend making it your main focus. Very simple: this will prevent you from getting the idea right. I know, link building has been a hot topic for such a long time, that it is hard to persuade people not to focus on it. But think about it this way: if you provide value and get well-networked in your niche, you won’t even have to build links anymore: the links will come on their own. People will link to you and cite your work without you even having to ask. After all, link building is not about forcing links – it’s about getting links flow in on their own. And in this perspective, guest blogging (and MyBlogGuest) is the perfect way to get linked to (in a proper way). Love MyBlogGuest for networking with other bloggers, and I agree that the backlinks are fairly secondary. More important is the exposure, and the dialogue that it brings via comments and discussions about the posts that are written. Thanks again for putting together a site where we can all virtually meet. It’s a great site, and I like the idea. It’s quite popular, and has had some good exposure. I personally haven’t used it yet though. Love what you say about link building not being about forcing links – but about getting links to flow in on their own. Such an important shift in perspective. Excellent Post .. i have noticed myself that backlinks will come on their own .. I have always heard back link bank link but i have never found the time .. and now they are coming all by themselves! Networking really helps a lot in what every field or topic we want. It also help us gather information, just like this post. Very informative! What i like about guest blogging are their benefits and some of those you will increase your reputation and and generate more traffic to website or blog site. I just want to ask: what are the terms in guest posting here? Thank you for asking. That information is found on my contact page. Alright, you read it, move on to the next one, see the same person there and so on, after a week of surfing you see the same people all over the blogosphere! Be it their own blog or their guest posts on your other favorite blogs. You immediately Google and read up every article that leads to ‘benefits of guest blogging’ and with all those inspirational articles out there you feel all charged up and decide to make your own guest post on your favorite blog. I have been looking ways to popularize my blog.This is totally new concept to me.I have never heard about it before.But, for sure i am attracted to it now. It looks much more easy then article marketing. I am really thankful to you for sharing this great info. Ann Smarty would love you to read ..Disabled Shop Blogging Contest and Paid Blogger Position Opportunity! To write a guest post is actually a part of referral marketing. You increase the value of you blog and also increase your visitor. Guest post is the best way of learning in blogging. Well this is not the first time I am reading about the power and potential of guest posting but until now I was not able to get a starting point.With MyblogGuest I think I will be able to starting doing guest posting soon. Thanks for giving such a nice platform. Yes! Our community is a great place to start! Ann Smarty would love you to read ..More Awesome Guest Posting Opportunities from Splashpress Media! They offer a pretty sweet Article Gallery were you can offer your blog as a place to post guest articles. You don’t always get selected but you will get a good article from time to time. Hi Ann, great post and what a novel idea. I’m ashamed to admit I’ve only guest posted once, and have committed to do a much better job going forward. I’m now your newest member! Your comment was fine; it just went to moderation. Your previous comment probably had keywords and WordPress sees each variation of what you put in the name field as a different name. Only commentators with a previous approved comment have their comments go immediately live. Hey Warren, thanks for joining! I hope we’ll inspire you to guest post more! Just returned from joining up on your side, Ann, looks interesting, esp the Gallery system you’ve set up there – I’ll want to get in on the action! Great to hear that, Neels! I hope you’ll find it useful! Of course, since it was a guest post. What I see when I know it was a guest post was something far from the blog owner interest. But definitely, their post was awesome as well. For me, this was a great help to exercise our social life and the way how we communicate well with others. The best guest posts are related to the blog where they’re published so they aren’t “far from the blog owner interest”. This blog is about growing your business or blog so MyBlogGuest is perfect for my readers. To write a guest post on other blogs is part of training of a blogger. It establish confidence in the blogger and makes it mental horizon wide. I know you meant me and not Ann so I thought I better answer your comment. I suspect the interview I published for you on Murray Newlands is what you sent you the visitors from there. We should share your great posts about Mommy Bloggers again. I’m sure many missed them the first time and would be very interested. Have you seen the new anti-spambot plugin Andy at CommentLuv wrote that is named after this blog? Very popular with bloggers already. Oh, and do meet Ann Smarty who wrote this guest post. 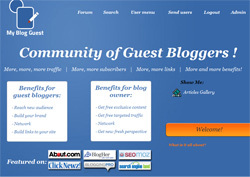 She created MyBlogGuest which is very useful for increasing your visibility. Darn FireFox lost my reply. I will answer this because I know you are talking to me and not Ann. Your guest posts on Murray Newlands and here are what drove two of your top ten traffic sources. That is a perfect testimonial to the effectiveness of guest blogging. That’s an awesome community, Ann. I am happy to be part of it! Absolutely right. I actually learned this by accident with my first (now defunct) blog — I just commented naturally on related blogs, and suddenly the mentions, sidebar links and kudos flowed in from the naturally curious and those who got genuine worth out of my comments. I recently had to “unlearn” backlinking to remember this simple principle. Thanks for the comment, Sophia. I wish more people started “unlearning” link building and focused on providing quality. I believe that we all agree that MyBlogGuest is an awesome tool. Also one thing I do want to agree with is your link building comment. Links should flow. Though having a link on one website going back to your website is ultimately good for Page ranks and SEO benefits, you have to ask yourself, will a person genuinely click on the link and visit the website, because if it doesn’t make the person want to click on the material and visit the website, what is the worth of it? Exactly. Thanks for the comment, David! I registered with the site several months ago but have been so busy building my blog and getting my business set up haven’t submitted any posts yet. Need to visit and see what’s happening as keep hearing good things about MBG. Thanks for the comment, Patricia! I am looking forward to seeing you there! MBG is really a great community. And I agree too that backlinks should not be the main or primary purpose in guest posting but providing useful, helpful and informative posts that will benefit readers. I think not focusing on link building is a valid point if the purpose of providing your expert opini0n is to increase the exposure of a blog (or rather your expert opinion), however when you look outside of blogging, to ecommerce for example, you will find that link building is always going to be the main focus for them – which is not always a bad thing (store owners are often experts in their field), however some budding emarketers will attempt to abuse this system with poor quality content. Hopefully guest blogging can moderate the blog appropriately. Hey Tom, yes, link building for ecommerce is tough. But I am a huge believer in the content. Even ecommece sites can start providing useful reports, insights and guides to get their name cited and linked to naturally! Well done on your achievements! I think having guest bloggers is a fantastic idea! This way you never run out of things to write and you have something fresh to post every time. I’m quite tempted to create something like this myself. Thanks for the tips. Thanks for the comment, Lu. yes, the concept is great – we are working hard on implementation now. You’re right, focusing on linkbuilding is not the way to go with guest blog posting. Just focus on creating great content. I once wrote a guest blog post that took me a week to write, and when it got put up, I immediately got 5 more backlinks after a week, and a bunch of new visitors. Eventually those new visitors linked to some other posts in my blog. We are just looking for authors who provide great quality! – how do publisher distribute their content? I mean can two people take the same article and publish it on their websites at the same time thus making duplicate content ? – as of now, is this a viable source of guest posts ? – do you offer some exposure for the bloggers or publishers(in the future) yourself (something like best guest poster, guest poster with most articles written, blogs with the biggest number of guest posts published) and feature them on your main page? I wish you luck with this project, it seems great and it should help a lot of busy people or those who can’t find/don’t have the time to find blogs to post one. I really see this as a future success! Hey Alex, thanks for your best wishes. – We consider posting one and the same article twice against the rules of our community. One article can only be posted once. In the article gallery, each article is removed from the gallery once it is given to any blogger. – We have sorting by category within forums, blog search article search. – I let the bloggers decide BUT we have community-driven control: we have ratings for the authors and reporting system. So once any member is suspected of providing low quality (as reported by other users), I contact him to clarify the rules. If he continues to promote low-quality content (to get links), I ban him from the forum. The quality of the content being spread is very subjective metric, so I don’t think I have the right to be the judge here. – I have a couple of blogs which are 100% driven by guest contributors which I find through MyBlogGuest, so I’d say the system works. – We have round-ups of guest post at our blog. We have HELP forums where we exchange guest posts and help promote all of them. With author rating system I plan to start awarding best authors of the month, year, etc. I have to admit, I haven’t gotten to spend as much time in MBG as I would prefer to, but it is the top community for getting to know other bloggers and networking for guest blogging. As far as the link building aspect, if you approach your guest blogging without that in mind and build a relationship with the owner of the blog you regularly guest post on, you will be given more freedom and leadway in the future to be able to link out to your own sites, as they will trust your judgement and know from the quality of your previous articles that you are only sharing things that are beneficial to the content and the readers. Great point about the “delayed” benefit for link building, Kristi. Thanks for sharing nice blog post, i like it so much. I just wanted to mention that most bloggers would have assumed your real comment was a spam comment because it is so short and too generic. When commenting be sure to make your comments specific to the post you’ve just read. That makes it much easier for bloggers to know your comments are sincere. I added a keyword phrase link to benefit your site and provided a link to how to use KeywordLuv. I encourage bloggers to also read the post about Building Traffic because it explains how to make your blog and blog posts including guest blog posts easier to find.